Today materials science requires the detailed knowledge of mechanical properties of materials even on the nano scale, and also the temperature dependence of these properties. Nanoindentation is the method of choice to determine Young's modulus, hardness, strain rate sensitivity, and more on the nanoscale. Temperature dependent nanoindentation measurements are troublesome, because the high accuracy with sub-nanometer resolution of the nanoindentation technique can be adversely affected by the variation of the ambient temperature. Conventional heaters introduce thermal drift into the measurement, because the heater is not only heating the sample, but also the indentation machine – accurate results are very difficult to achieve. 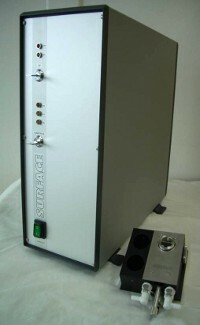 To overcome these difficulties, SURFACE has developed a Laser Heater System for sample sizes of up to 15 mm in diameter (12×12 mm² square) and up to 3 mm thickness, using the latest available infrared diode laser technology. Laser heating confines the heated area to the sample or substrate itself, no additional heated parts exist. Thus the effect on the measurement setup itself is minimized for the most stable and accurate results. 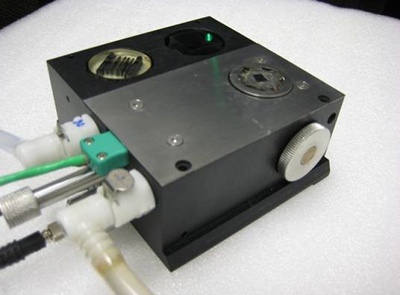 The infrared laser radiation is transferred to the substrate backside via an optical fiber and additional optical components, which are integrated into a sample holder matching the standard holder of the nanoindentation system. The sample holder is optimized for highest mechanical and temperature stability. It is water-cooled and temperature controlled, and functionally optimized materials are used to further reduce the thermal drift of the system. 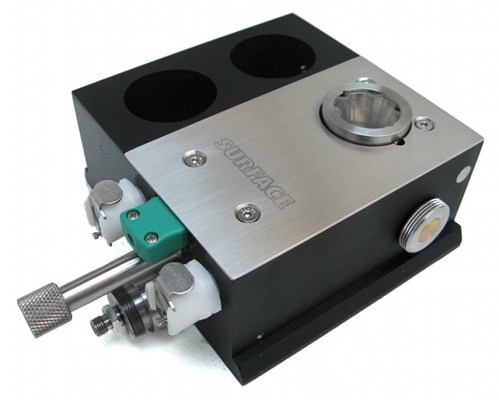 The system uses a fixed thermocouple, mounted into the non-IR-absorbing substrate holder plate. The substrates are attached to the holder by a special paste, and the laser heats up only the substrate plus the mounting paste. Compared to a thermocouple mounted directly to the substrate surface, the error is only 3°C at 500°C (tested with a Si sample, 0.5 mm thick). 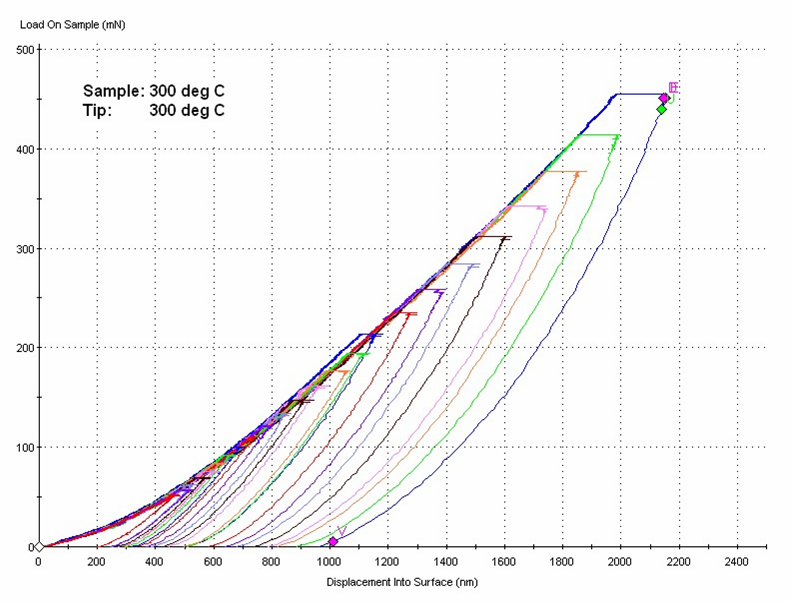 Another advantage is the possibility to test sample properties und highly dynamic temperature conditions. 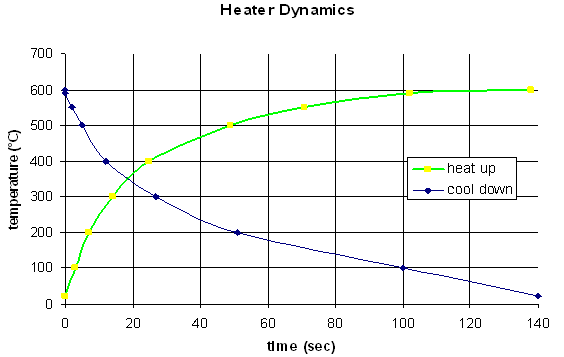 Depending on temperature and sample, the heating and cooling rates can reach over 25°C/s. Typically rates in excess of 100°C/min are possible over the whole temperature range. This opens new and interesting possibilities in dynamic material testing. Compared to an oven design, where all system components are heated to the same temperature, laser heating offers a wider temperature range and a great improvement of the necessary stabilization time (no need to wait until all system components have reached the desired temperature). 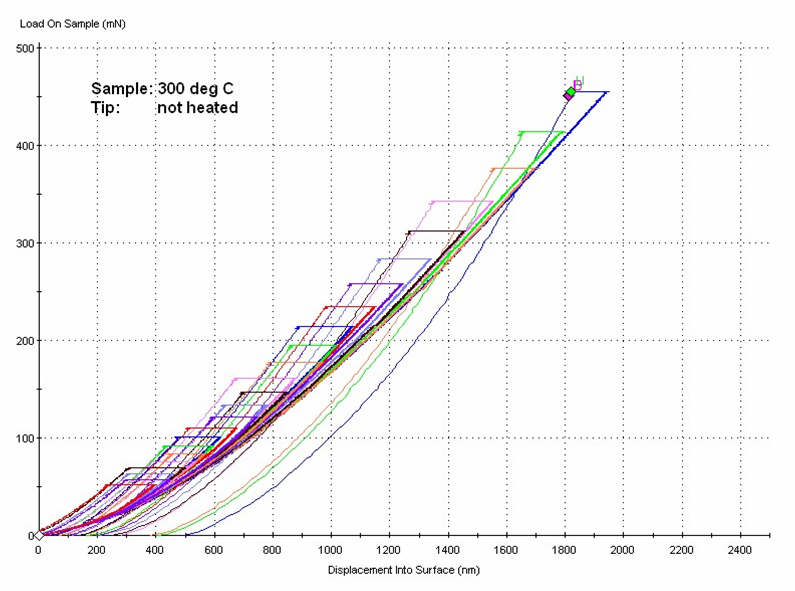 Drift of measured indentation depth with tip heated to sample temperature. The drift is “normal”, indicating that the tip is sinking into the sample, very similar to room temperature measurements. Drift of measured indentation depth with non-heated tip. The drift is always negative because of the expansion of the tip when it is heated by the hot sample. 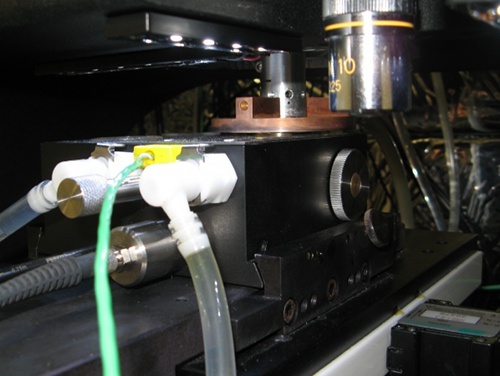 When investigating materials with low thermal conductivity and highly temperature dependent mechanical properties, the influence of a cold tip to the measurement of heated samples cannot be neglected. But even for other samples, the temperature change of a cold tip touching a hot sample will result in a thermal expansion that influences the measurement. When holding the measurement at a steady load, this will result in a decrease of the measured indentation depth over time, although in reality the indenter tip does not move up. This is avoided by a heated tip: If the measurement is held at a steady load, the result will remain constant or indicate a “sinking-in” of the tip (creep), as it would for a room temperature measurement. This enables reliable dynamic measurements at elevated temperatures. 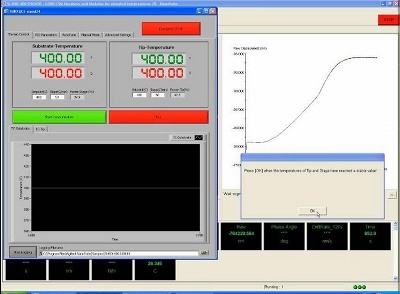 To accomplish the tip heating while keeping the advantages of laser heating of the sample (like short stabilization times and dynamic heating/cooling), as additional add-on for the Agilent XP nanoindenter head a laser heated indenter tip is available. A thin optical fiber is installed inside the hollow shaft of the XP head and heats a special tip with integrated thermocouple. Individual settings for tip and sample temperature enable the optimization of temperature-dependent indentation tests. 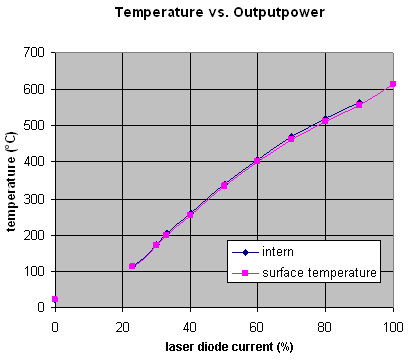 Although our standard laser heater design is optimized for the Agilent G200/XP nanoindenters, this sample heating principle can also be applied to other brands/models and measurement techniques, even under UHV conditions, like SEM (scanning electron microscopy) or TEM (transmission electron microscopy). Please contact us with your special requirements. Substrate size: approx. 12×12×3 mm³ (15 mmØ×3 mm heigth) max.